I took this photo late yesterday evening, so I had little or no natural light, so my source of light was just the dining room overhead light which made for terrible shadows! Settings were RAW, AV mode, f/2.2, ss 1/60, brightened and cropped in PSE4. The composition was kind of dull, so I tried to tilt it in PSE4, but I couldn't get it to work. I've got to learn more about PSE! CC welcome and TFL! love your colors! the white looks great too. 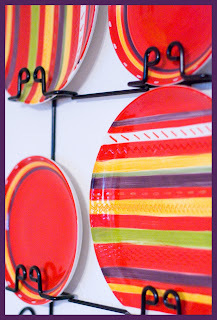 Fun shot of the plates, very colorful and the white looks great! now this is cool!!! yes, love the color! OOOOO, those vibrant colors are wonderful! Oooooh.. awesome plates! I love the colors. Great job with the composition. Beautiful picture. Love Love Love the color. Great shot I don't see the shadows you are talking about.